As the long-awaited final volume of Patrick Leigh Fermor’s memoirs is published, Jonathan Lorie celebrates the brilliant travel writer. First published in The Independent, Saturday 14 September 2013. Leigh Fermor strode briskly over, despite his 89 years, shook my hand and launched into an unstoppable reminiscence of tramping across Europe in 1933. “I borrowed £15 from somebody and caught a boat to the Hook of Holland, heading for Constantinople. I got somebody to give me a letter to a very nice baron in Bavaria and I went to stay with him … And then I borrowed a horse off somebody and crossed the whole of the great Hungarian plain on this horse – it was the right way to see it – it was totally unspoilt then … At the Iron Gates I caught a ship for about 50 miles, then stayed with a very nice consul in Sofia …” And he rattled off the names of places and people that must have vanished long before I was born, in a lost world of feudal Europe, as though it were all just yesterday. That epic journey and the power of his storytelling will be in many people’s thoughts this weekend, as Leigh Fermor’s final book of travel memoirs is published. Fans have been waiting three decades for this. The Broken Road is the last, missing volume in a trilogy that many thought would never be completed. It concludes the story he told that day in the Byron Room, of a youthful trek from London to Istanbul in 1933, catching the last echoes of an older order before the Second World War changed everything. Across this vanished world Leigh Fermor had walked aged 19, meeting monocled aristocrats and ragged chimney sweeps, sleeping in cowsheds or in castles, dodging gypsy encampments, cadging lifts on cargo boats, falling for pretty girls, dancing and drinking and talking his way to the heart and soul of central Europe. The journey was enchanting, the writing rich and vivid. But he never finished the trilogy. The two previous volumes – A Time of Gifts and Between the Woods and the Water – appeared in 1978 and 1986 to huge acclaim. They prompted Jan Morris to hail him as “the greatest of living travel writers”. Then the words stopped, 500 miles from Istanbul. For years, friends and fans pestered him to finish it. He never did. Perhaps it was the failing powers of old age, perhaps it was the pressure of living up to expectations, perhaps – like that medieval French poem – he could no longer recall enough of the ending. When he died in 2011 – seven years after our meeting in Piccadilly – it seemed another great loss to literature. But three years before his death, his biographer Artemis Cooper had stumbled across a 45-year-old typescript filed at John Murray’s office. It was called “A Youthful Journey”, and it was Leigh Fermor’s early attempt to describe the post-Danube part of the route. Her interest rekindled his, and slowly he began to sift his way through this fading text, revisiting the great journey, reworking the words, a man in his nineties taking one last shot. He never finished. The final manuscript was a mass of revisions and expansions that petered out just days from Istanbul. But Cooper and the travel writer Colin Thubron took it upon themselves to sort it into best order and present it to the world. It was perhaps a homage to their friend as much as a literary laying to rest. And John Murray published it, a posthumous memoir saved from oblivion at last. The result is The Broken Road. It’s as charming as its predecessors, a fascinating glimpse of a vanished era. Leigh Fermor drifts through the pre-war Balkans, meeting White Russian officers, dancing at diplomats’ parties, falling in love with a French-speaking student, drinking slivovitz with coachmen and concierges. On a moonless night by the Black Sea he nearly drowns, but stumbles his way into a cave where a ragged gang of fishermen and sailors sitting around a fire take him in for a night of wild drinking and traditional dances. It is perhaps the emotional heart of this book – a moment from an ancient myth, which his derring-do and joie de vivre have brought to life – glitteringly told, impossibly romantic, unrepeatable today. Quite how far he fused memory and imagination is an interesting question. All three of these books were written decades after the fact, with only a tattered map as aide-memoire. He had lost all but one of his diaries – some on the road, some in a neglected storeroom at Harrods. Like that other fine travel memoirist of the 1970s, Laurie Lee, you can’t help wondering how much of this actually happened. It was an imagination fed by the life that he chose to live. What other travel writer can claim to have ridden in a cavalry charge across a castle drawbridge with sabres drawn, as he did during a Balkan rebellion? Or lived in a manor house with a Romanian princess, who he met on reaching Istanbul? Or kidnapped an enemy general and driven his staff car through 22 enemy checkpoints, as he did in wartime Crete? The latter was his most famous exploit, and you can visit the place where it happened – a remote stretch of road beside an olive grove where Leigh Fermor lay in wait with a band of Cretan partisans. The episode was made into a book and film, Ill Met By Moonlight, starring Dirk Bogarde as Leigh Fermor. 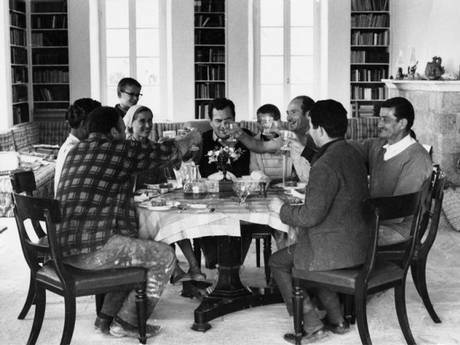 For years afterwards, Leigh Fermor was fêted throughout Greece for his wartime service with the partisans, when he had lived for months in mountain caves, organising resistance to the German occupation. 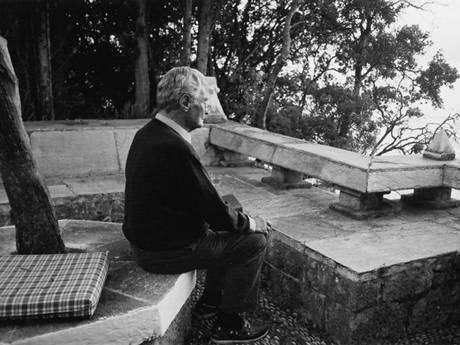 The war left him with a profound attachment to Greece and its people, and in the 1950s he and his wife Joan built a house there, on the Mani peninsula. It was famed for its elegance and its house guests. John Betjeman described the library, which looked over the sea, as “one of the rooms of the world”. The travel writer Bruce Chatwin chose to have his ashes scattered on the hills above, by Leigh Fermor. Here he wrote two luminous books on Greece – Mani and Roumeli – and slowly began the trilogy which has now, finally, been completed. He nicknamed this work “The Great Trudge” – a view understood by his editors. This entry was posted in Profiles of Paddy, Volume Three - The Broken Road and tagged Patrick Leigh Fermor on December 14, 2013 by proverbs6to10.